Duluth, GA – You don’t have to ask yourself what to do in Duluth because a ghoulishly good time awaits all ghosts, goblins, mummies, humans and canines as Howl on the Green invades Downtown Duluth, with a boo-nanza of bewitching fun, Friday, October 30th starting at 6:00 p.m.! This final fang-tastic Fridays-N-Duluth of 2015 will fly away until next year, but not before this haunt-ingly good time unveils a fright-night of entertainment including Fire dancers, Aerialists, Breakdancing Werewolves and other Creepy Creatures! Costume contests, freekishly fabulous food, games, Trick or Treating on Main Street, music and eerily awesome live entertainment also awaits your arrival on October 30th! A giant spider web will catch unsuspecting victims, moths, and other creepy characters will provide spine-tingling entertainment, while the American Red Cross Blood Mobile wants your blood that evening! So BEWARE! Those victims brave enough to return for another season of Howl on the Green will be bone-chillingly thrilled that DJ Rob and Luminocity Entertainment Division (LED) are back for a third year to wow everyone with spook-tacular music, dancing characters, a hair-raising entertainment, and an aerialist performance! Costumed contestants will over-run Duluth Town Green with a bewitching mix of attire to impress the judges! There will be separate divisions for kids, adults, families/groups and a Hall-O-Weenie class just for daring dogs who aren’t afraid of other creepy critters in costume! 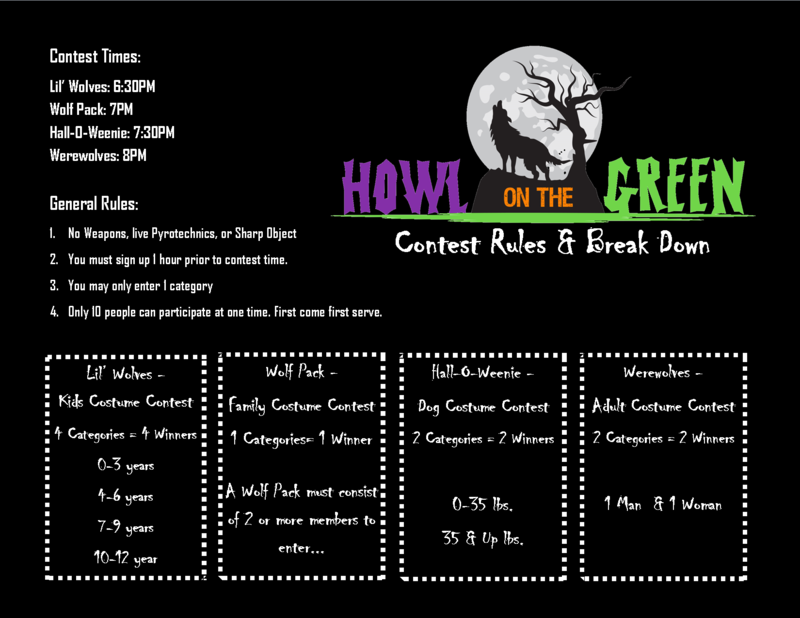 Four separate age categories will cover all the little ones in the Lil’ Wolves division of the costume contest. One frightening WOLF PACK prize will be awarded for best family costume. A WEREWOLVES competition will include those daring adults going solo in costume with both a men’s and women’s winner! And the evening includes two categories for best costumed canines! Three human judges will crown the scariest human costume winners, while Brady Charles, the Hall-O-Weenie wonder judge, will once again “sniff-out” the best Canine Costume! This spirited pooch will return to the stage to “cast his spell” in choosing a winner for both the large and small dog categories! Lil’ Wolves will be divided into four age groups for the littlest ones starting at 0-3 years, a 4-6 year-group, 7-9-year-olds, and those ages 10-12. The Lil’ Wolves contest will occur at 6:30 p.m., followed by the Wolf Pack family or group competition at 7:00 p.m. The Hall-O-Weenie canine contest hosted by dog-judge extraordinaire Brady Charles, will take the stage at 7:30 p.m. with a small dog group of those weighing 35 pounds or less, and a larger dog grouping for those rattling the scales at more than 35 pounds! Those frightful SOLO men and women entering the WEREWOLVES division will compete at 8:00 p.m.
Hair-raisingly great food will invade Howl on the Green, October 30th with a bewitching caravan of gourmet trucks as temptation to all ghosts, goblins, and other characters who dare to visit the area for this devilish night of surprises! The American Red Cross will be collecting your blood as their bloodmobile makes a Halloween landing to take donations from 5:00 – 9:00 p.m. Anyone 17 or older can donate and reservations are suggested but not required using the sponsor code: “CityofDuluth” or by calling 1-800-Red-Cross. Blood donations are always needed especially after the South Carolina floods! Keeping all creepy characters entertained is challenging! But giant games will be available at Howl on the Green with life-sized Checkers, Chess, Connect 4, Hi-Towner, and a Bounce House! Fun crafts will be available and the Duluth Town Train will take any ghosts, goblins or humans needing a ride, to destinations unknown! Come join all of the hair-raising Halloween fun with this Fridays-N-Duluth fang-tastic finale, October 30th from 6:00 – 9:00 p.m.! Start planning a costume now for you or a four-legged canine companion and enjoy a Fright-Night Friday! It promises to be a howling good time! !